THE average turnaround time for ambulances transporting people with potentially life-threatening conditions to our hospitals has increased by 14% since the closure of Belfast City Hospital’s A&E department, The Detail can reveal. 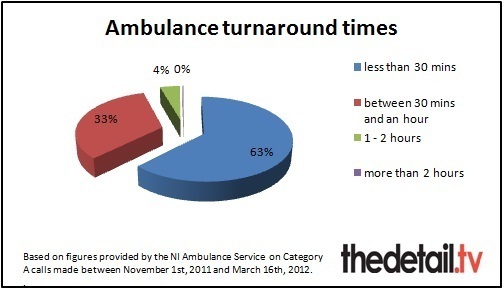 The Northern Ireland Ambulance Service (NIAS) has provided detailed data on ‘turnaround times’ to us in response to a Freedom of Information request. The turnaround time is how long it takes an ambulance to clear a hospital after arrival. It includes patient handover to clinical personnel within the hospital and the time taken to clean and replenish ambulances to be ready for the next call. Turnaround delays can have an impact on overall response times if ambulances are held back from taking on their next 999 call. In March our investigation into ambulance response times in Northern Ireland uncovered a wide variation in response times in different postcode districts. In April TUV Assembly member Jim Allister raised concerns about turnaround times following a response from the Health Minister Edwin Poots to written questions posed by Mr Allister relating to ambulance call outs in the previous month. 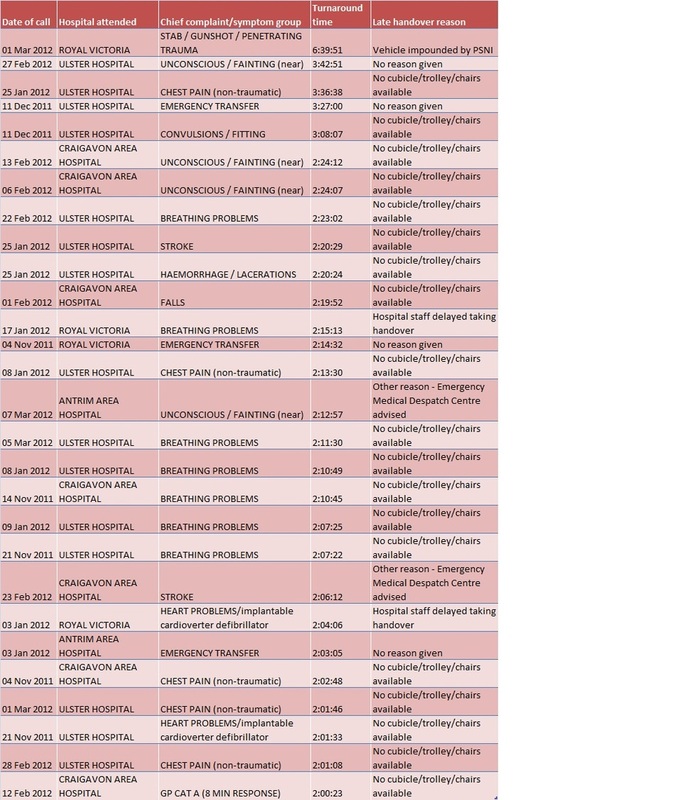 We requested detailed information on all of the Category A calls made between November 1st 2011 – when the City’s A&E officially closed – and March 16th 2012 (the date our request was lodged). Category A are the most serious 999 calls and are considered potentially life-threatening. We asked for the date of each call, the chief complaint/symptom group, which hospital the patients was taken to, the time the ambulance arrived and cleared the scene and the reason for any delay. The NIAS provided this breakdown for a total of 14,958 Category A 999 calls made during the four and a half month time period covered by our request. A reason for delay was only communicated by the crew to the Emergency Control Centre for 3,118 of the calls. We also requested information on average turnaround time for all hospitals in the year prior to November 2011 to enable us to make a comparison with previous turnaround times. There was a 12% increase in turnaround times between these two periods. The NIAS also provided data on turnaround times for all Category A emergency calls between November 2010 and March 2011 which allowed us to compare figures for exactly the same four and a half month period the previous year. This more direct comparison showed an even larger increase (14%) in average turnaround times. The Ambulance Service also compiled figures just looking at the same time period for only the 13 main emergency units in Northern Ireland. The increase here was 9%. The data released to us is available in full in files below this article. The reason for a three and a half hour turnaround time for one case at the Ulster Hospital in January 2012 was that there was no cubicle/trolley/chair available. This patient was suffering from chest pains. There was a wait of over two hours 20 minutes for a patient who had suffered a stroke. Again this was as a result of no cubicle/trolley/chair being available at the Ulster Hospital. The turnaround times for hospitals within the South Eastern Trust area are up almost 20% when compared with the same four and a half month period a year ago. 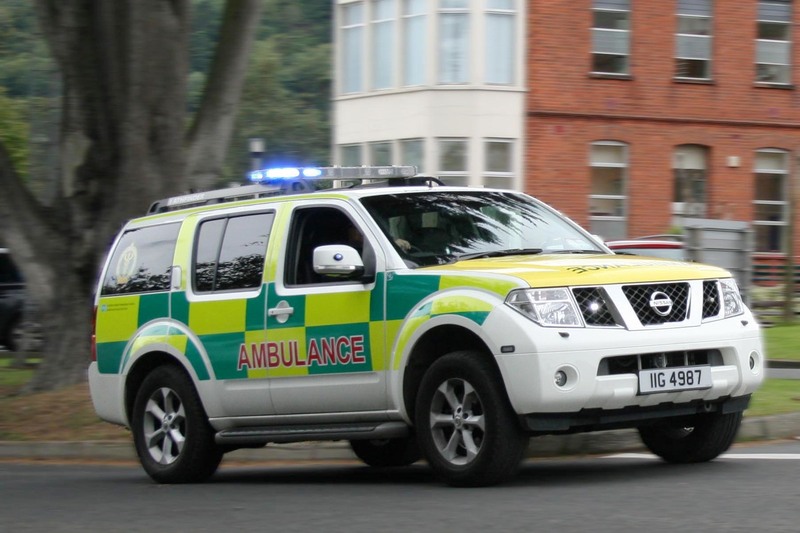 Between November 1st 2011 and March 16 this year, the NIAS dealt with 14,858 Category A (life-threatening) 999 calls. Twenty-eight calls had a turnaround time of two hours or more, 639 were between one hour and two hours, 4,947 cleared the hospital between 30 minutes and an hour and, finally, 9,344 cases took less than 30 minutes to handover the patient and prepare the ambulance for the next emergency call. Category A patients during this four and a half month period were transported to 39 different hospitals. 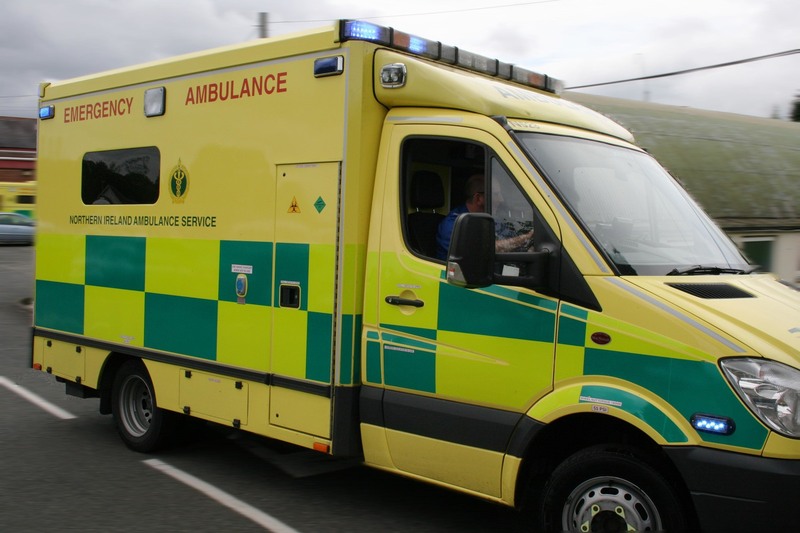 A number of hospitals only dealt with one emergency call – for example Ballykelly Independent Clinic, Downshire Hospital and Letterkenny Hospital. At the other end of the scale, the Royal Victoria Hospital in Belfast dealt with patients from 3,064 Category A 999 calls during the same time period. It has become the main centre for emergency care in Belfast since the closure of the City Hospital’s A&E on November 1st. In March the director of the Royal College of Nursing, Janice Smyth, said that the strain on the RVH’s A&E department was preventing staff from delivering proper care. She said nurses were under intense pressure and struggling to perform. In an attempt to quantify this stress, we compared recent turnaround times with data on average turnaround times released by the NIAS relating to 999 calls made between November 2010 and November 2011. We have also compared our detailed recent data with the same four and a half month period a year previous. From November 2010 to November 2011, ambulance crews transported patients to 41 different hospitals – including psychiatric clinics, independent hospitals and hospitals in the Republic of Ireland. Overall, the average turnaround time increased by 12% from 25 minutes in 2010/11 to over 28 minutes in the period from November to March 2012. We compiled a table to examine the change in turnaround times for hospitals dealing with 10 or more Category A calls between November and March. Turnaround times were down 10% at the Royal Maternity but up 17% at Downe Hospital and up 13% at the Royal Victoria Hospital where 3,064 seriously ill patients were taken between November and March. The recent average turnaround times at the Royal Victoria and Ulster Hospitals (both over 36 minutes) were more than double the turnaround times at Tyrone County Hospital in Omagh at 15 minutes. 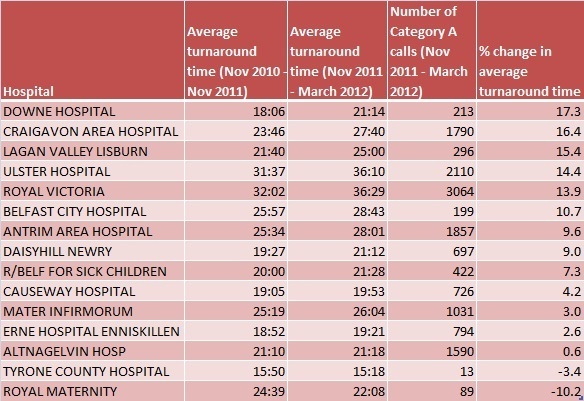 The NIAS data comparing the two November-March periods does not tell us how many calls each hospital had to deal with or the reason for any delays – but it does show that turnaround times went up 93% for patients taken to the Mid Ulster Hospital in Magherafelt, almost 80% at Tyrone Psychiatric Hospital and up 40% at the Northern Ireland Cancer Centre. On the flip side, turnaround times were down 59% for patients taken to Holywell in Antrim and also down 37% at Knockbracken in the Belfast Trust Area. The table below gives a more detailed breakdown. 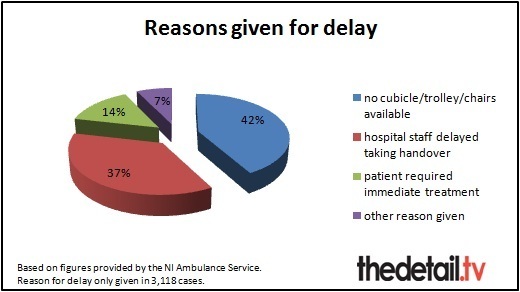 The reason for any delay was only given in 3,118 of the 14,958 Category A cases dealt with by ambulance crews between November 2011 and March 2012. Of these, in 1,308 cases there were no cubicle/trolley/chairs available, 1,140 were due to hospital staff delays in taking the handover and 442 patients required immediate treatment. The longest turnaround time was recorded as six hours 39 minutes with the reason given that the ambulance was impounded by the police. A total of 28 calls had a turnaround time of two hours or more. These were at the Royal (4 calls), Antrim (2), Craigavon (7) and Ulster (15). In 19 of these cases, the reason was given that there was no cubicle/trolley/chair available. Of the total calls, 639 had a turnaround time of between 1 hour and 2 hours. Of these 245 gave the reason of there being no cubicle/trolley/chairs available, 216 cases because hospital staff delayed taking handover and 101 had no reason given. We have also compiled a list of the calls which resulted in the longest turnaround times and the reason given, if provided. The 28 calls which had a turnaround time of two hours or more include a wait of more than three and a half hours at the Ulster Hospital in January 2012 because there was no cubicle/trolley/chair available. This patient had chest pains. In another case, again at the Ulster Hospital in Dundonald in Janury 2012, there was a wait of over two hours 20 minutes for a patient who had suffered a stroke. Again this was as a result of no cubicle/trolley/chair being available. In all, 15 of the 28 longest turnarounds were at the Ulster Hospital (53%), 14 took place at the RVH in Belfast, seven at Craigavon and two at Antrim. Of the turnaround delays between one and two hours, 275 took place at the Royal Victoria Hospital, 160 at the Ulster Hospital, 89 at Craigavon Area Hospital, 53 at Antrim Area Hospital, 15 each at Altnagelvin and Daisy Hill, 11 at Royal Belfast Hospital for Sick Children and 21 at other hospitals. The NIAS Freedom of Information response stated: "The data provided relates to an A&E ambulance arrival to an A&E Hospital and when they have “cleared” the location. Please note that this will include attendances to A&E departments and wards etc. “The crew will remain with the patient until they have been handed over to the relevant clinical personnel within the hospital environment. “The ambulance turnaround time will include patient handover and other aspects such as time necessary to clean and replenish ambulance to make it ready for the next call. This in no way relates to patient handovers. “Where a reason for the delay has been communicated by the crew to the Emergency Control Centre this has been provided. “It should also be pointed out that while the attached data relates to Category A calls, this will be based on information received at the time of receiving the 999 call. When the A&E crew arrives at the scene the clinical condition of the patient may be different than previously communicated. Increasing demand on the NIAS was highlighted in the service’s annual report for 2010/11. The report stated that there had been a 4.5% increase in the volume of 999 calls responded to by ambulance crews, amounting to 5,376 extra calls per year. It continued: “Another key factor influencing ambulance capacity was the impact of increased demand and service pressures in our acute hospitals. “During 2010/11 we saw increased numbers of patients waiting longer than before for admission to accident and emergency units. This delayed the handover of ambulance patients to hospital staff which, in turn, led to queuing of ambulance personnel in A&E with their patients. “We recognise and accept that not all ambulance patients who are taken to hospital have a high clinical priority in the A&E department and other patients may have more urgent clinical needs. Using Freedom of Information, we also requested copies of any documentation held by NIAS relating to concerns raised by the ambulance service about the closure of the City Hospital’s A&E and the impact this had had on services. It was estimated that it would take more than four days to locate, retrieve and extract the information. “The whole healthcare system has changed greatly in recent times, particularly the configuration of hospitals and acute services. For the Belfast HSC Trust temporary change regarding Belfast City Hospital, NIAS was engaged fully with HSCB Commissioners, the Belfast Trust and other relevant stakeholders to ensure that the consequences of the proposed change on ambulance activity was recognised and fully taken account of.